This is a guide about making a crocheted denim purse. 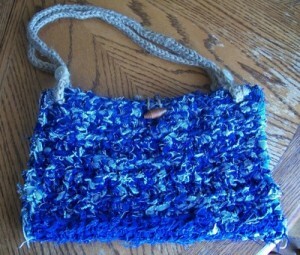 Recycle denim material as strips to crochet a unique bag. This is a denim purse with jute handles and a button closure. I crocheted a rectangle for a sample, since I wasn't sure the heavy weight denim would work for this project. Instead of starting over, I chose to make a purse with it. Cut denim into 1 1/2 inch strips. I just used scraps I had from other projects, so the colors don't match exactly. Sew ends together to have one continuous piece to work with. I did this by machine, but you can also do it by hand. Crochet a rectangle twice the size you want your purse to be tall. My purse ended up being 14 inches wide by 9 inches high. Crochet jute as wide as you would like your handles to be. I crocheted the jute about 1 1/2 inches wide until I liked the width for the purse. Sew the side seams with the sewing needle and fishing line. Attach the jute handles through a "hole" in the crocheted piece and tie a slip knot. Repeat until the handles are attached in a placement that satisfies you. For closure, attach a large button and an elastic loop for closure. Excellent job, and a great way to use up all the old jean's legs I've saved. I've made dozens of "bags" by just opening the seams, and sewing both legs together to form a "bag". We use them for lots of things, sport's equipment, extra linens hung on a hook in the closet. I made a "Tunnel" at the top and crochet heavy yarn to make a drawstring, and they'll go anywhere, hang anywhere, so old blue jeans are never really done. They just keep on going, kinda like the Energizer Bunny. Recycle those old denim jeans or shirts into a cool Rag Bag! I crocheted this rag bag using two old denim shirts that were worn out. I think that is lovely. You could make some tiny crotcheted daisies to make it even nicer. I feel inspired by your lovely bag to have a go myself!